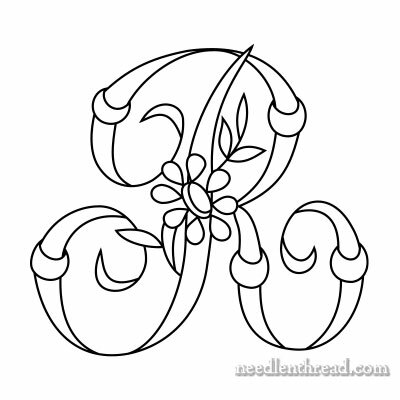 Just a quick little offering today – the next four letters in the Daisy & Rings Monogram Alphabet. I always feel So Accomplished when I can crank out more than two letters at a time! I know, I know, I’m slow! In any case, for those looking for the next four letters – O, P, Q, and R – here they are! Back to some stitch talk for these monograms. One of my Needle ‘n Thread friends wrote to ask if I thought this particular alphabet would work well, embroidered entirely in padded satin stitch. She’s a beginner, but she likes the padded satin stitch for monograms. I like the padded satin stitch for monograms, too – I love it! But it’s not something I’d foist upon a beginner with this alphabet. 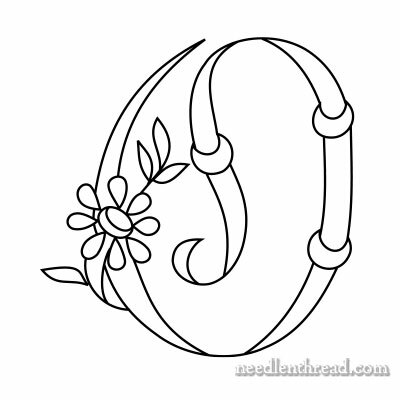 There are definitely some elements in these letters that would be (more or less) easy to embroider in padded satin stitch and achieve a beautiful result, even as a beginner – the rings, the daisy petals, the center of the daisy, the leaves. But to try to work the padded satin stitch for the whole letter and the daisy & rings adornment would be difficult, I think, especially for a beginner. I’d find it difficult myself, especially where the flower rests on the letter. It can be done, but to do it without its looking crowded or jumbled – to do it in a way that keeps the integrity and balance of the design – can be difficult. Instead, if you’re really keen on using padded satin stitch, use it for the areas suggested above. For the main body of the letter, you can achieve a nice contrast with the padded satin stitch by using a a line stitch for outlining the main lines of the letter. For example, stem stitch, split stitch, chain stitch, whipped backstitch, or maybe an overcast satin stitch over one thread or even a knotted stitch like Palestrina stitch, would all work. Then either leave the inside of the letter lines empty, or work them in a seed stitch, which would provide good textural contrast with the padded satin stitch elements. I probably wouldn’t work a knotted stitch (like Palestrina) for the outline and seed stitch for the filling – it would be too much texture, I think. But a smooth outline and seed stitch filling would look really beautiful, in contrast with the padded satin stitch elements – or a smooth outline and no filling at all – or a textured outline and no filling. So, there are some options if you want to incorporate padded stitch in a way that would be less challenging for a beginner. This is essentially what we discussed when first introducing these letters, but hopefully, this helps clarify a bit! Here are the printable pages for the O, P, Q, and R. If you choose “no scaling” (or a similar setting) on your printer, the letters should print at 2″, 3″, and 4″ high. You can enlarge and reduce them to suit your needs! Good Morning, Mrs. Corbet! I’m so glad for this post because now I’m not scared to tell you my plan for this alphabet! I plan to use it to embroider Psalm 23:1 inside a ring of flowers. I’m thinking Stem Stitch to outline the letters, Split-Stitch filling, Padded Satin Stitch for the rings, Granitos for the Daisy petals, and flat Satin Stitch for the centers! I’m not sure about the leaves yet. Do you think it’s a good idea for a “not quite beginner, not quite intermediate level” stitcher? This will be a gift for a friend, my first time not using a pre-bought stamped pattern, my first time on linen, my first time doing something framed and hung! UG! Now I’m scaring myself! I blame you with a giddy joy and excitement! I do hope you like the idea, but please feel free to give me a metaphorical head-slap if it’s bad! 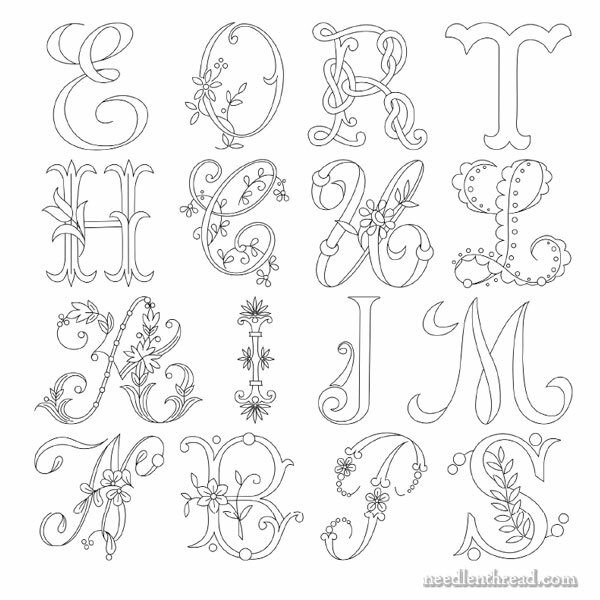 Hi, Kristina – I could see using a few of the letters as initials at the beginnings of lines, but I can’t see working all the words of a psalm in these types of letters. Is that what you meant? I think your stitch choices sound good! Missed this post yesterday, busy, busy getting ready for a holiday in Turkey on Friday for 8 days it’s a yoga plus Pilates holiday, my sister is a yoga teacher and her friend teaches yoga as well as Pilates I can’t wait. 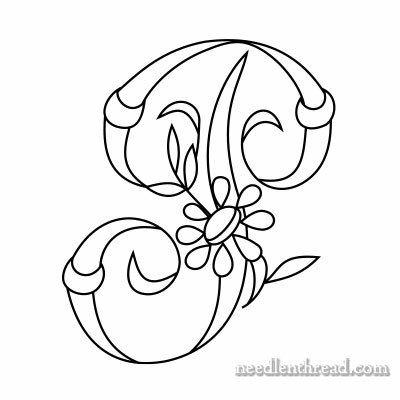 Anyway the monograms above are really pretty especially the O and the Q, you are almost finished now with the Daisy and Ring alphabet that reminds me how is your monogrammed ebook coming along I can’t wait to buy it. I have been following you on Facebook. I came across some padded Alphabet embroidery by Elisabetta Ricami which is absolutely stunning. I would like to do some of this beautiful embroidery but don’t know anything about padding same. Can you be of help to me please. 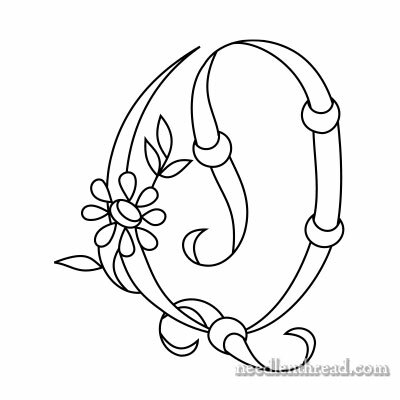 Hi, Michelle – I have quite a few tutorials here on Needle ‘n Thread for padded satin stitch. If you use the search feature in the right column and search satin stitch or padded satin stitch, and even satin stitch monograms, you’ll come up with quite a few articles.